How much water does a toilet actually use? Most people worry about the things they don't know. Here at Conserv-A-Store we don't want you to worry about something such as that so when we recently got the question about how much water does a toilet actually use, we thought to ourselves... "ummm well maybe people don't know this answer to this question." We want to examine the water usage of toilets, tell you more about how toilets use water, how you can save water and money, and last but not least a small inspection of the differences in elongated toilets and round bowl toilets. Let's start with the basics. Most to all toilets use water (there are some urinals that do not on the market but these are more specialized toilets we won't examine now) With the use of water, the supply of water is also a concern when it comes to a toilet using water constantly all day. From the least amount of water to the most, there are toilets that save water such as low flow toilets that reduce the amount of water used in a toilet flush and bowl. The difference between an elongated and round toilet is pretty simple but necessary to explain. Luckily there is a noticeable difference in the two toilets. If you care to know the exacts- you can measure from the two mounting bolts on the lid of the toiler bowl to the very front of the bowl. What you'll find is that the round will be 16.5 inches for the round bowl and 18.5 for the elongated bowl. Another way you can check it out is from the center line of the toilet to the wall. The round toilet will be smaller and the elongated will be longer. There are also ADA height and comfort height seats in case you prefer a higher sitting toilet for something more comfortable or for special needs. Space may also be a call for concern. Whether you have a lot of space or a little will depend on it you want to get a larger (elongated) or a smaller one (round) toilet. Not only the size but the flushing capacity is important as well. 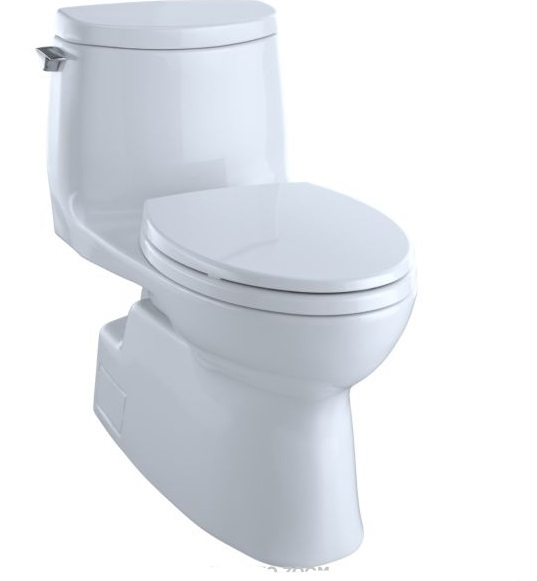 Toilets such as the Carlyle II 1G One Piece Toilet 1.0 GPF with Elongated Bowl by Toto are premium in the market and also come with varying styles depending on your wants an needs. These toilets are high on the water saving chart of how much water a toilet actually uses and saves. Toilets can be extensive and intricate or they can be something basic and simple. Most people don't think much about toilets until they need to replace one or something brings how much a toilet can save them to their attention. Keeping that in mind we want to help you be more informed about what toilets to choose and why you should choose a better water saving toilet than not. Water saving toilets can save water and money in your home and ultimately effect the betterment of the World. Simple steps to make a big impact on your life and your world. We look forward to any questions comments or concerns you may have. We're here to help you on your own eco-friendly journey. Reach out to us or visit the website anytime at www.conservastore.com. Hopefully this article gave you guide on how much water a toilet actually uses.